Also known as tooth sealants. Sealants have offered a protective plastic coating that covers the surfaces of teeth to help prevent tooth decay(cavities). The net result is a smoother tooth surface, one which is less likely to trap food and plaque and one which is easier to clean with your toothbrush. Tooth decay can lead to tooth death. Because of their many bumps and grooves, the chewing surfaces of children's teeth are highly susceptible to cavities. These grooves (called pits and fissures) may be more problematic for some children than for others. Children in cavity-prone years (aged four to 17) and adults all face the same pit and fissure problem. Premolars and molars have the most pits and fissures, and are difficult for people of any age to reach with a toothbrush or dental floss. Dentist will clean the teeth, dry them and apply a slightly acidic solution that is designed to help the sealant bond to the tooth surface. Each tooth is painted with a very thin layer of the sealant coating. Dentist will use a high-intensity curing light to harden the sealant after it has been painted on your teeth. Sealants can last for many years, but they should be checked regularly and assessed for possible re-application. The cost of dental sealants can range from approximately $30o $50 per tooth. Dental insurance will often cover the cost of dental sealantsbut still, this dependent on the level of insurance you have. See your dentist about the advantages of sealants for your particular situation, and the out-of-pocket costs associated with sealants. Saliva protects the tissues in the mouth, helps to remove infected white blood cells, yeast, viruses and bacteria from the teeth and surrounding mucosal surfaces. Lysozyme (for example) a molecule in saliva, acts as an antibacterial agent. It is effective because it breaks down the sugar molecules in the cell structure of the bacteria on the teeth. Saliva also mineralizes to protect the enamel on the surface of teeth. It may be caused by disease, medications or part of the natural progression of age, compromises the protective elements provided by saliva against pathogens, irritants and toxins that enter the mouth. Caused by bacteria, viruses and fungi, are the cause of several oral diseases, including dental caries, periodontal diseases, herpes labialis and yeast infections (also known as candidiasis). May affect the craniofacial structure, which can result in impairments that involve other body organs and systems. Tobacco is a risk factor for oral and pharyngeal cancers, periodontal diseases, candidiasis and dental caries. Diet containing foods high in sugar and saturated fats is a contributor to tooth decay. Alcohol use is an independent risk factor for oral cancer. Initially diagnosed through oral symptoms. Affects women and is characterized by the inability to produce a sufficient amount of saliva. This syndrome can cause pain and produce rapid dental caries. Often having complex origins and causes that can affect other organs. Many TMD (jaw joint dysfunction) patients complain of facial pain and difficulty in moving surrounding muscles as well as other areas of the body. The medical and dental communities are taking steps towards accurately documenting the connection between medical conditions, diseases and oral health. Did you know that vascular diseases and cancer have both been linked to oral health? It Seems like the oral cavity is often the mirror of the body. Preventing oral disease often seems to prevent diseases in other organs or systems. Many diseases appear first in the mouth and are thus found while patients are in the dental chair. Maintaining a perfect dentition allows you to maintain a healthy diet. For example, people with no teeth have to change their diet to accommodate for their handicap. Finding it difficult to eat fruits or raw vegetables, they instead opt for softer foods that are high in saturated fats. Further, recent studies have determined a connection between untreated dental infections and death.There are many children who die from dental infections or conditions relating to dental infections. Yet, many cases were not documented as such due the lack of knowledge about the oral-systemic connection. AIDS : Intra-oral hairy leukoplakia (white patches on tongue and inner check) and Kaposi Sarcoma are indicators for AIDS. Autoimmune Conditions : Pemphigus and lichen planus (auto-immune diseases) have oral manifestations. Diabetes : People with diabetes who happen to have periodontal disease may suffer excessive bone loss of the jaw or surrounding bone structure and have difficulties in healing. Fanconi Anemia : Fanconi anemia is a rare genetic syndrome characterized by short stature, myelosuppression (diminished bone marrow activity) and the development of oral cancer in young adults. The genetic disorder has been linked with an increased tendency towards periodontal disease and other dental abnormalities. Heart Disease : Evidence is mounting as to the role that oral microbes and host response might play in the causation of heart disease and stroke. Authorities have concluded that poor oral health caused by chronic dental infections may increase the risk forcardiovascular disease and stroke. Human Papilloma Virus : Human papilloma virus has been linked to oropharyngeal cancer as documented in a recent study conducted by the New England Journal of Medicine. Stroke : The evidence is mounting as to the role that oral microbes and host response might play in the causation of heart disease and stroke. Recent studies have linked periodontal disease with strokes. Microbiologic arrays have been developed and are now used to screen for the pathogens that cause tooth caries and periodontal disease. Child aged two years old can now be screened for certain microbes to assess if they are at increased risk to develop dental caries. Cancer is a lethal disease, 60% sufferers are died because of this. If diagnosed early, survival improves significantly. Dentists now have some important aids : Vizilite and Velscope. They detect abnormal tissue in the mouth by measuring fluorescence. Heart attack and stroke can be detected by CRP test than the result of high cholesterol. CRP (-Reactive Protein) is as a response of chronic inflammation. If the dentist finds that the results are questionable, further medical evaluation will be required. These types of referrals have led to the detection of cancer, arthritis, gout and diabetes. Dental hygiene, also known as oral hygiene, is the process by which preventative dental care is provided to avoid dental emergencies. At the core of dental hygiene is the in-home dental care regimen you perform. Tooth brushing is important,but still only brush the teeth alone will not remove the calculus that builds up over time. Calculus must be removed to lower your risk of toothaches, cavities, periodontal disease or even the loss of all your teeth. Removing calculus will reduce the chances of needing root canals, tooth extractions, dental bridges, crowns and more. Calculus builds up on the teeth. If calculus forms below the gum line, bacteria can invade and create a host of other dental problems. Furthermore, the surfaces and areas between the teeth and under the gum line must be maintained and treated on a regular basis in order to ensure proper dental hygiene. Your dentist then works with your hygienist by further examining the teeth, mouth and gums to provide any necessary treatment for tooth decay or gum disease. Regular dental visits are critical at any age for the maintenance of dental hygiene. Recommendation that patients visit with their dentist and dental hygienist a minimum of two times each year to maintain proper dental hygiene. Cleaning and whitening the teeth. Help to prevent the onset of tooth decay and gum disease. Avoiding bad breath are added benefits of tooth brushing. Why We Must Brush Our Teeth? The foods that we eat contain lots of sugars and starches. If plaque combines with these sugars and starches, an acid is produced that attacks tooth enamel and causes tooth decay. Dental plaque can irritate the gums and become red, swollen, tender and can bleed easily. Gum irritation can lead to gingivitis, an oral condition that precedes gum disease (periodontitis). If plaque is not removed, the gums can eventually start to pull away from the teeth. When this happens, bacteria and pus-filled pockets can develop and the bone that supports the teeth can be destroyed. Once the bone is destroyed, the teeth will loosen and/or require removal. Brushing your teeth removes plaque from the tooth surfaces while flossing removes plaque from in between the teeth. High recommends that you brush the teeth twice a day for about two minutes, after eating. Hold the brush at a 450 angle. Use gentle and short strokes, moving your toothbrush back and forth while brushing the outside areas of your upper and lower molars. Use the same motions and brush the outside areas of your upper and lower incisors. Brush the tongue to remove bacteria and keep your breath fresh. In order to maintain good oral hygiene, it is important to brush your teeth at least twice a day, floss daily, use an oral rinse, eat a well balanced diet and visit your dentist for regular check ups. Which One Shoud I choose : Electric or Manual? Deciding whether to buy an electric or manual toothbrush basically depend to what you desire as far as comfort and convenience. Oral health experts believe that brushing with an electric toothbrush can be more effective than using a manual toothbrush. Electric toothbrushes are designed to replicate the functionality of the professional brushes used by dentists for in-office cleanings. Increase brushing time while helping users reach difficult areas of the mouth. Have a setting that notifies the user when to stop brushing. Helps to prevent over-brushing that can damage tooth enamel and foster gum recession. Usually have larger handles, which are great for kids, older adults and people who suffer from arthritis. The best toothbrush to buy is an extra soft bristled brush with a small head that fits easily in your mouth and has a handle that feels comfortable in your hand. Provide more flexibility than electric toothbrushes. Help to reach difficult areas of the mouth. Offer convenient accessories that aid oral hygiene, such as built-in tongue scrapers that can be more effective in cleaning the tongue than brushing. Be sure to replace your toothbrush (or toothbrush head) every three months or sooner if the bristles start to fray or wear out. Schedule an exam with your physician to identify the right smoking cessation program. Inquire about a counseling service, nicotine patch or gum, nasal inhalers and sprays or non-nicotine prescription medications. Schedule a professional dental cleaning and oral health checkup. Be certain to maintain a proper dental hygiene home program. Yeah,smokers trully need it. Treat yourself to a new a tongue cleaner, dental floss and mouthwash. Initiate a stress reduction program such as an exercise regimen, Pilates or a yoga class. Teeth and gums are more susceptible to bacterial accumulation during pregnancy associated increase in hormone levels. It’s very important to take care for oral health before, during and after pregnancy. Maintaining oral health will reduce the risk of pregnancy complications that can result if dental conditions are left untreated. It’s a common condition affecting women during pregnancy. It is caused as a result of bacteria becoming trapped in between your teeth. It can be managed if diagnosed early enough. Also known as periodontitis, it leads to the deterioration of bone and surrounding gum tissue. This condition develops as a result of untreated gingivitis. Periodontal disease can also be asymptomatic (producing no symptoms at all) even while silently causing erosion of the gums and supporting bone structure. Pregnant women suffering from periodontal disease should consult with their dentist and medical doctor immediately. Also known as pyogenic granulomas. Pregnant women with gingivitis or periodontal disease are more susceptible to the development of pregnancy tumors. These tumors make women eat or speak and can cause discomfort. Don’t’ worry this tumor still can be remove by dentist during pregnancy. During second trimester, it is important that you visit dentist for an oral hygiene check up and professional dental cleaning. Invasive restorative and cosmetic procedures should be avoided. There are a number of dental procedures that should be avoided during pregnancy. Brush and Floss. Brush and floss three times a day to prevent the accumulation of bacteria on and around the teeth. Morning Sickness and Vomiting Aids. Morning sickness and vomiting may be improved with a warm water or antibacterial mouthwash rinse. Baking soda used as toothpaste has been known to relieve an upset stomach; however, check with your doctor before using baking soda during pregnancy, especially if you have high blood pressure. A Healthy Diet. A diet for healthy gums during pregnancy includes calcium, B12 and vitamin C.
Pregnant women who practice good oral hygiene and consult with their dentist and medical doctor are considerably less likely to experience problems throughout the term of their pregnancy. What will the dentist do if I go to exam my oral and dental? Should I worry? Is it gonna hurt? These questions often we heard, sometimes there is such a concern when we want to see dentist for routine check up. Dental examination is a systematic process during which your dentist will investigate many facets of your oral and systemic health in order to identify pathologies or concerns and develop a uniquely customized treatment plan that is catered towards maximizing your oral health while meeting your goals and expectations. What dentist do during examination? List of medications that currently taking. List of vitamins and natural healing remedies that currently taking. Any experience with anesthesia and the adverse reaction including Family member. Any medical conditions that currently being treated for. All of these informations are important as first step for treatment planning and precaution for treatment. Second step is examination of teeth and supporting structures. This step involves the incorporation of various techniques, technologies and therapies. Dental hygienist explores every surface of every tooth to uncover new cavities and examine the quality of existing fillings with a crown horn or fishhook. Fillings can break down and require replacement and mal also be replaced for improved esthetics. Check calculus deposits by dental hygienist using pigtail tool. X-rays or bitewings (molars and premolars) to detect abnormalities (if necessary). Healthy gums adhere tightly to the teeth. The dental hygienist typically performs periodontal probing to measure the circumference of each tooth and the strength of the supporting bone structure. A calibrated probe is inserted between the teeth and gums to measure the level of "gum adherence" to the teeth. The goal is to record a number of one, two or three. A number of four or more indicates periodontal disease and potential bone loss. If the gums do not tighten after the cleaning, there is scheduled for a scaling or root planing appointment. For more severe cases, dentist will referred to a periodontist for additional treatment. The hygienist cleans each tooth using scalers (scraping tools), curets (scoop-shaped instruments) and sometimes additional high-frequency ultrasonic scaler. The hygienist gently polishes the teeth to ensure that the enamel is not disturbed. Toothpaste or a combination of baking soda and water may be used to complete the polishing. 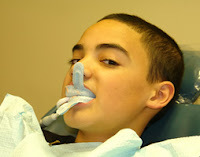 Last step : fluoride treatment. Dentist will spend some time talking about the findings, concerns and any problematic issues. You may be advised to consult with a specialist if more complicated or advanced work is required. A treatment plan is discussed at this point in the visit. Professional cleaning is recommended every six months or as often as every two months should you be at risk for periodontal disease, are a smoker or a diabetic. Brush and floss teeth after every meal, three times a day. Improper brushing such as brushing too hard can lead to enamel loss and gum recession. Flossing between teeth is done to remove debris that can cause bacteria to form. The hygienist reviews nutritional habits that support the teeth, gums and bone structure in the mouth. Special attention for people who suffer from bad breath (halitosis), dry mouth, tooth sensitivity and the like. Smokers are informed that they face an increased risk for periodontal disease, which leads to tooth loss. Nail biters can be risking injury to the enamel on their teeth. Teeth grinders are informed that the dentist will speak to them about a mouth guard. Dental hygienists also have special treatment considerations for babies, youths and senior citizens. By keeping mouth healthy, you thwart many potential dental problems, keep your smile bright, and ultimately avoid heavy financial investments at the dental office. Bad breath can be appear because of the interaction between air interaction and bacteria in the mouth, the nose or the stomach. Nasal dysfunction, including a genetic abnormality in the nasal passage, may inhibit proper mucous flow. The bacteria found in sinusitis, post-nasal drip and allergies may pass from the nose to the back of the tongue. There are some Bacteria causing the Halitosis.These bacteria are found in other types of unpleasant odors, including corpse scent (a combination of oxygen and sulfur compounds and/or nitrogen-containing gases such as cadaverine), decayed meat (putrescine), rotten egg stench (hydrogen sulfide), smelly feet (isovaleric acid), as well as feces aroma (methyl mercaptan and skatole). When bacterial plaque is not removed from the teeth, gums, or in between the teeth, it continues to grow and ultimately may lead to halitosis, tooth decay and gum disease. How to Omit The Bad Breath? Brush your teeth at least twice daily. Brushing and flossing are particularly important after high protein meals or other meals that trigger foul breath and dehydration. You can use an antiseptic mouthwash. Use it in the morning, before bedtime and after eating. Antiseptic mouthwash ingredients may vary from one product to another, and include chlorhexidine, chlorine dioxide, zinc chloride and eucalyptus oil. Tongue scrapers can also be useful to prevent bad breath. Scrape the mucous off gently at the back of the tongue. I you have appliances such as dental braces and dentures should follow the specific instructions for cleaning and caring for these appliances. Try to remove the appliance at night before sleep. Appropriate food and drink can support proper saliva flow to help limit the possibility of halitosis. Fibrous foods can help to maintain a healthy mouth. Eating a healthy breakfast every morning initiates saliva flow after a night's sleep when bacteria and odor tend to buildup. Drink a lot of water. Water intake is important to help inhibit bad breath. Drinks that are high in sugar and acid such as sodas and juices do not support a pleasant oral health environment. Straw. It's very useful in sending sugary or sticky liquids past the teeth and tongue where they can become lodged and house bacteria. Certain toothpastes, toothbrushes, mouth rinses and breath sprays are made to relieve dry mouth. Every patient has different shaped nose and throat. That's why before the surgery start, Oral and Maxillofacial Surgeon will measure the airway at several points and check for any abnormal flow of air from the nose to lungs. UPPP is usually performed on patients who are unable to tolerate the C-PAP. This procedure shortens and stiffens the soft palate by partially removing the uvula and reducing the edge of the soft palate and eliminates tissue from the back portion of the mouth near the top of the throat. The adenoids and tonsils may be removed as well. Your airflow blockage be life-threatening, the ENT may find it necessary to build an opening in the windpipe through a procedure called tracheotomy. An operation on your nose might be necessary to improve a deviated septum or to remove polyps that are blocking your airflow. The hyoid bone is a U-shaped bone in the neck located above the level of the thyroid cartilage (Adam's apple) that has attachments to the muscles of the tongue as well as other muscles and soft tissues around the throat. The procedure secures the hyoid bone to the thyroid cartilage and helps to stabilize this region of the airway. GGA treat obstructive sleep apnea. It is designed to open the upper breathing passage, and tightens the front tongue tendon, reducing the degree of tongue displacement into the throat. This operation is often performed in tandem with at least one other procedure such as the UPPP or hyoid suspension. This procedure moves the upper and lower jaws forward. As the bones are surgically advanced, the soft tissues of the tongue and palate are also moved forward, again opening the upper airway. MMA is the only technique that can create the necessary air passageway to resolve their OSA condition for some individuals. Sleep apnea is a serious condition. If someone close to you has spoken of your loud snoring and has noticed that you often wake up abruptly, gasping for air, consult your Oral and Maxillofacial Surgeon immediately!